It’s a rainy morning here in the New York City area — not at all like the bright, cloudless day of eight years ago. Of those affected, back then, by the events of the day, many were friends and co-workers of people who died. Today I want to tell a story about one of those. Tony used to work with me at the T.J. Watson Research Center. I was his manager when, one weekend in the late ’90s, I got a message from our purchasing system that he’d ordered a book about web page design. I thought that odd, considering that our research group wasn’t working on anything related to that, and I made a mental note to ask him about it on Monday. Before I got a chance to ask, Tony came to me. He’d accepted a job with a Wall Street firm, doing web services stuff for them, and he’d be leaving IBM. He thought it a good opportunity, and I was pleased for him: I knew he wasn’t completely happy at Watson, and maybe this would fit him well. After he left, we kept in loose touch, exchanging a few email messages here and there at rather protracted intervals. I heard about a bit of travel he’d done, and that sort of thing. And he liked his job; he had a level of satisfaction that he hadn’t been getting with us. Then, on a Tuesday morning in 2001, a colleague and I came out of an early meeting and went to the cafeteria for a cup of tea. The conference rooms adjacent to the cafeteria were overflowing with people watching something on the screen. “What’s going on?”, we asked. Someone said the World Trade Center buildings were in flames. We quickly got our tea and went out to the main area of the cafeteria, where the television screens confirmed what we’d heard at the conference room. Our meeting had finished at 9, and we’d just missed seeing the second plant hit. 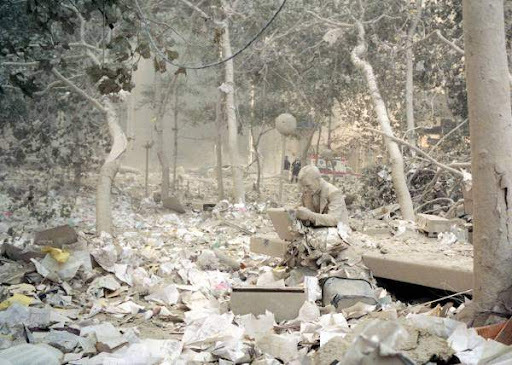 We watched, stupefied, as the towers collapsed, and we eventually went back to our offices. I put a video feed in the corner of my computer screen, as I tried to get some work done. And I thought about Tony. I wasn’t sure what building he worked in. I knew he was in lower Manhattan, but I didn’t know exactly where. I sent email to him. Four hours later, when I got the “unable to deliver mail for four hours” message, it was clear that his company’s servers were down. That wasn’t a good sign, but it didn’t mean anything directly. I wondered. It was Sunday when he responded. He said he was OK, but hadn’t been able to get online until then. He had been running late on Tuesday, Tony told me — running, literally, as he ran to catch the Staten Island ferry to Manhattan, and missed it. He waited for the next ferry, and watched the planes and the buildings from the water before they turned the ferry around and returned the passengers to Staten Island. He worked, he told me, on the 98th floor of the north tower. Had he caught that ferry he ran for, he’d have surely died. As it was, he lost his personal laptop, which he’d left in his office when he left on Monday — the reason he hadn’t been online since — and, far more importantly, he lost hundreds of his co-workers. Hundreds, who had made it to work on time that morning. I understood the “but”, indeed. How can you cope with hundreds of your colleagues going to a fiery death, and not... not have your view of your work changed fundamentally? I also marvelled at how things had worked out for Tony. Perhaps, I mused, he was late for his ferry because he’d been buying a cup of coffee. Perhaps the barista hadn’t been particularly snappy that morning, and, just maybe, that slow barista, whom Tony had likely cursed at the time... saved his life. We exchanged another few messages then, and our next correspondence was a couple of years later. He’d left his computer job, and was selling real estate in Manhattan. Changed fundamentally, yes. I wonder how he’s fared through the recent mortgage and financial crisis. Selling real estate doesn’t seem to be quite the thing now, but one never knows. I should check in again.